While he admitted Ireland were the better team ‘in some moments’ the coach is confident of making the knock-out stages. CROATIA COACH SLAVEN Bilic lauded his team on Sunday for their 3-1 victory over Ireland, saying they had opened to road to the quarter-finals, though he conceded that going further at Euro 2012 could be tough. Bilic said after the final whistle in a rain-swept Municipal Stadium in the western Polish city of Poznan, where Ireland and Croatia launched their Euro 2012 campaign. “Maybe the Irish were the better team in some moments, but I think that if you look, the overall impression is that we were the much better team,” the former Croatia defender said. 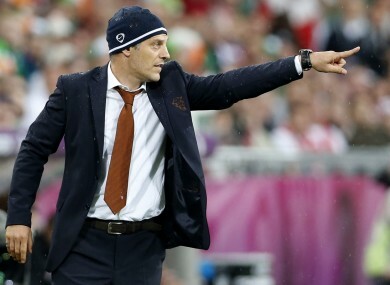 Bilic underlined that both teams had gone into the match fully aware that they had to perform. “I’m sorry for the Irish. They were looking for a chance in this match. But it was the same for us,” he said. Earlier, in the Baltic port of Gdansk, heavyweights Italy and Spain had drawn 1-1, meaning Croatia top the table. Wolfsburg’s Mario Mandzukic scored a double in the Ireland game, his first goal in the just third minute to make it 1-0 and the second after the break to take the score to 3-1. “Mario’s a top class player. He’s playing at his top. Wolfsburg stayed in the Bundesliga thanks to him,” Bilic said of the 26-year-old striker, who was named man of the match. Handing over the award, former Yugoslavia striker Predrag Mijatovic heaped praise on Mandzukic. “Just go on like this, I’m sure you can score more goals in this tournament,” he said. Mandzukic said the game had been tough. “It was a hard match. We knew that it wasn’t going to be easy,” he said. ”We did our best and I think we deserved a victory. It was very important that we scored an early goal,” he added. Forty-three-year-old Bilic, would, after six years in charge, like nothing better than to lift the trophy before he moves into club management with Russia’s Lokomotiv Moscow. Like Ireland, Croatia earned their Euro 2012 slot in the playoffs, in their case against Turkey – exacting revenge for the Turks’ penalties victory in the Euro 2008 quarter-finals. Their progress four years ago raised hopes of a return to Croatian football’s 1990s glory days, when Bilic was a pillar of their defense. Croatia, emerging from the war sparked by the collapse of Yugoslavia, reached the quarter-finals of Euro 1996 and finished third at the 1998 World Cup. Doing well at Euro 2012 would have added symbolism for a nation set to join the European Union next year. Poll: Is there still hope? Email “Open road: Croatia will not fear anyone now, says Bilic”. Feedback on “Open road: Croatia will not fear anyone now, says Bilic”.